Drinkers in pubs throughout Sedgley are used to people coming round collecting for charity, but one local magician and comedian has come up with a spellbinding method of raising funds to help others. 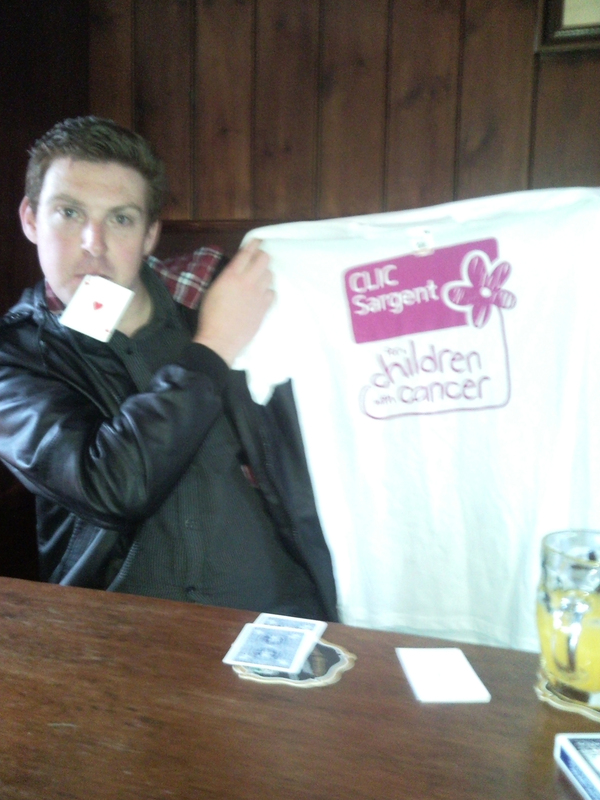 In order to raise money for children’s cancer charity CLIC Sargent, Colin Tighe is performing a range of baffling card tricks for customers at Sedgley’s Wetherspoon pub, The Clifton, this Thursday, August 25. And, in preparation for this event, the talented magician and comedian treated regulars at the Beacon Hotel to an impromptu display of trickery on Sunday evening. 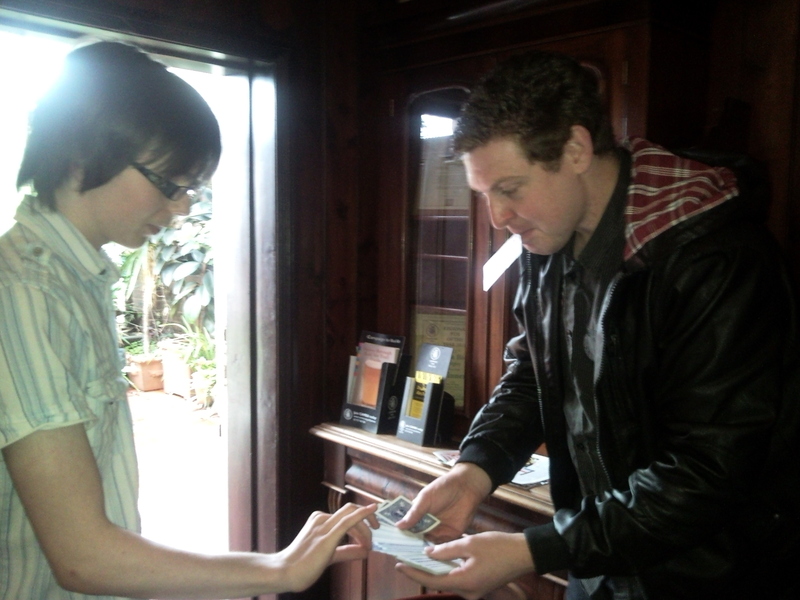 Colin, aged 28, has been perfecting card tricks since the age of 16, when a visit to a magic shop in Leamore, Bloxwich, inspired him to take his first foray into the secretive world of illusion. “I bought £20 of tricks that day, but when I got home and tried them, I couldn’t understand why they didn’t work,” he laughs. Over time, Colin’s skills as a magician grew, although his family didn’t always take his hobby seriously. “I loved watching magicians such as David Copperfield and Lance Burton on TV, but my dad, who wasn’t really into magic, wouldn’t always allow me to – he thought it was a bit silly,” explains Colin. However, the young illusionist persevered, perfecting his tricks until he felt confident enough to perform them in bars across Wolverhampton. “I’d go to the shop to buy tricks, then learn them on the bus going back to Sedgley,” he recalls. “Then, I’d go to places such as the Old Still and the Civic to try them out on people. Colin, it seems, is never without props for his hilarious and often perplexing magic tricks. While doing this interview for Sedgleyscene, he shuffles a pack of cards and then asks us to choose one – the king of spades. He then shuffles the pack once more and pulls out what he thinks is my chosen card. However, when this turns out to be the ace instead, an apparently crestfallen Colin breaks off to answer his mobile phone. “Don’t laugh – my phone’s a bit old,” he smiles, before pulling a 1970s-style receiver from his bag. After talking to what he claims is the Magic Circle and explaining that the trick has gone wrong, he then hands the receiver to me. “Of course, there’s no-one there,” he laughs, before asking me to unscrew the mouthpiece. Inside, there is a card, folded up. My card, the king of spades. It’s an amazing trick and one which defies belief. Sleight of hand, distraction – however it’s explained, this is a dazzling and highly entertaining performance. He’s not wrong. Colin’s half-hour stint in the Beacon on Sunday netted somewhere in the region of £40 for CLIC Sargent – something he aims to build upon during his afternoon performance on Thursday at The Clifton. And, dazzling regulars at The Clifton is just the start of Colin’s commitment to charity. Next year, he plans to cycle from Sedgley to Cornwall, demonstrating tricks along the way to raise funds for the Youth Cancer Trust. It’s clear this affable magician likes nothing better than helping others through performing tricks. And, this connection with his audience is what makes Colin stand out. Colin’s tricks achieve not only that, but through raising money for charity, help leave a lasting impression upon the lives of many others. Colin’s will be performing magic tricks at The Clifton, Sedgley from 12.30pm until 3pm on Thursday, August 25. Visit his website to find out more about this hugely talented Sedgley-based magician and comedian.